I’m not much of a cusser. Cussing just doesn’t really do it for me. I prefer to use more creative forms of expression like “well pumper my nickel bread!” and things like that. But every now and then something comes along that just needs a solid DAMN DAMN DAAAAMN!!! 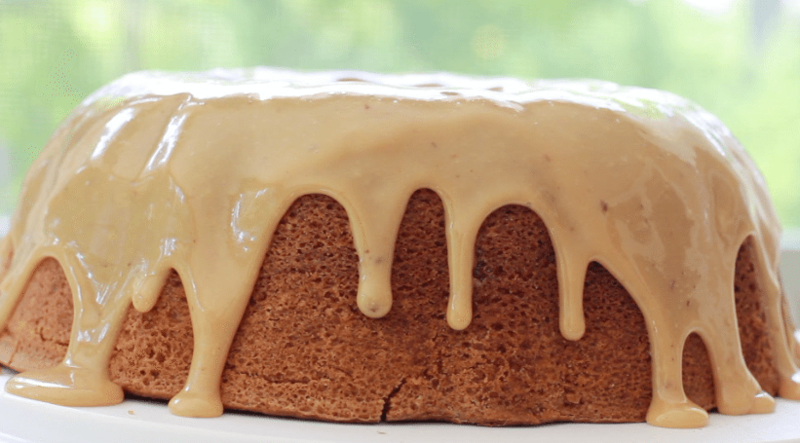 This brown sugar caramel pound cake is one of those things. Mercy. Excuse the crappy pictures by the way. Would you look at me differently if I told you that every time I got a slice I had to sing “I want some of your brown shuuuuga!” ? I really did and now that you’ve just read that I can bet a dollar you’ll probably do the same thing. We’re in this together now. 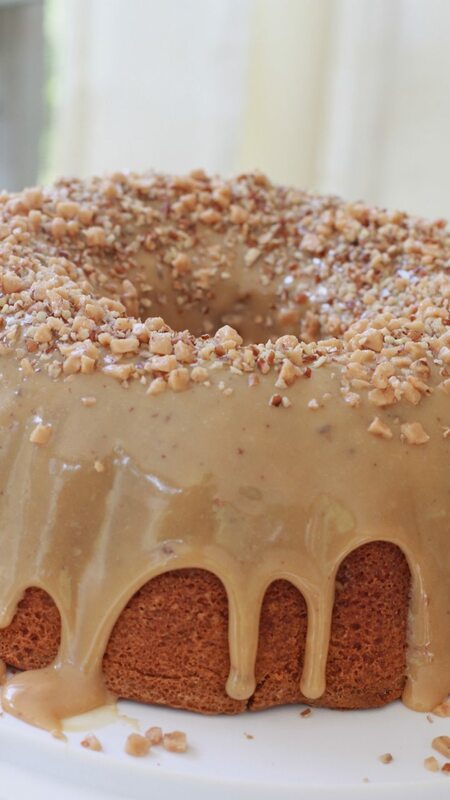 But omagosh y’all let me tell you….. this pound cake! Baaaaabeeeee! Please forgive me for keeping this to myself for so long. 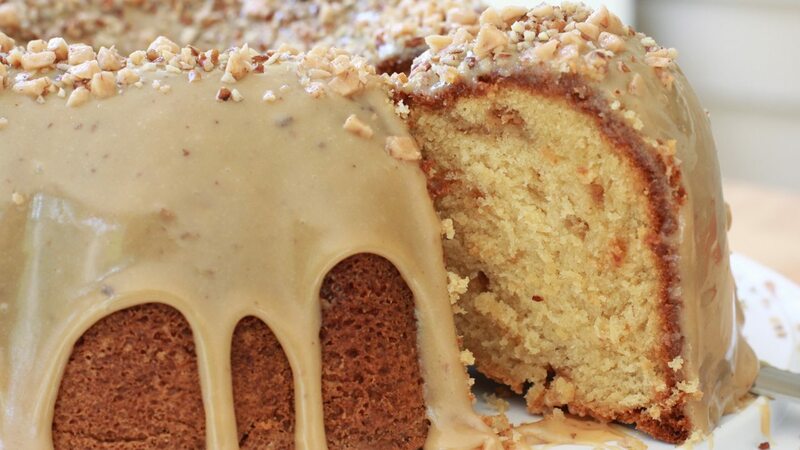 I made this brown sugar caramel pound cake years ago for a cookout and totally forgot how amazing it was. I filed it away under “recipes to post in the fall on Divas Can Cook” and never looked back. I’m good for doing things like that. It would be a sin to make you guys wait until the fall time for this. I You NEED this. Like right now! 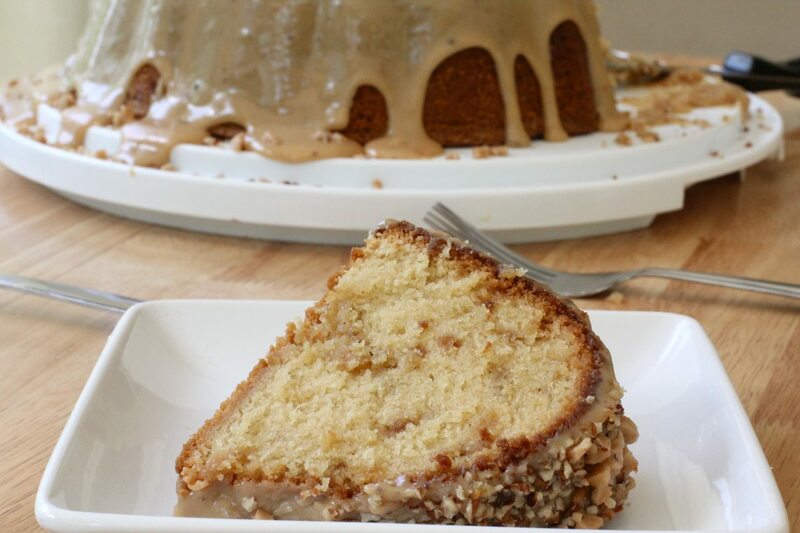 This brown sugar caramel pound cake is incredible!! It’s fluffy and moist as heck! Full of buttery, vanilla, caramel flavors… epic I tell ya! Those sweet & salty toffee pieces thrown into the batter and the glaze is everything good and holy. Don’t even get me started on that easy caramel glaze. 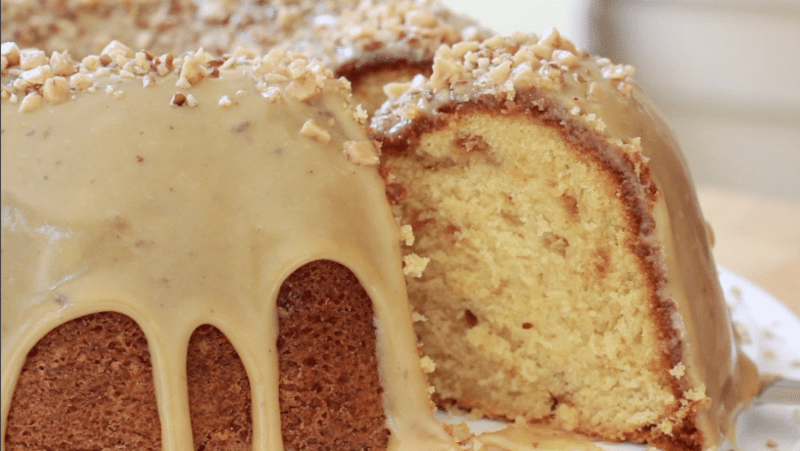 Throw on a side of vanilla ice cream and this pound cake becomes simple yet a bit over the top. Perfect for company and holidays. I decided not to add the pecans into the batter but you certainly can put some in if that’s your thangthizzle! Even some finely shredded coconut would be good in this pound cake. I’m sorry, what did you say? Oh you want more pound cake? Thought you’d never ask!! 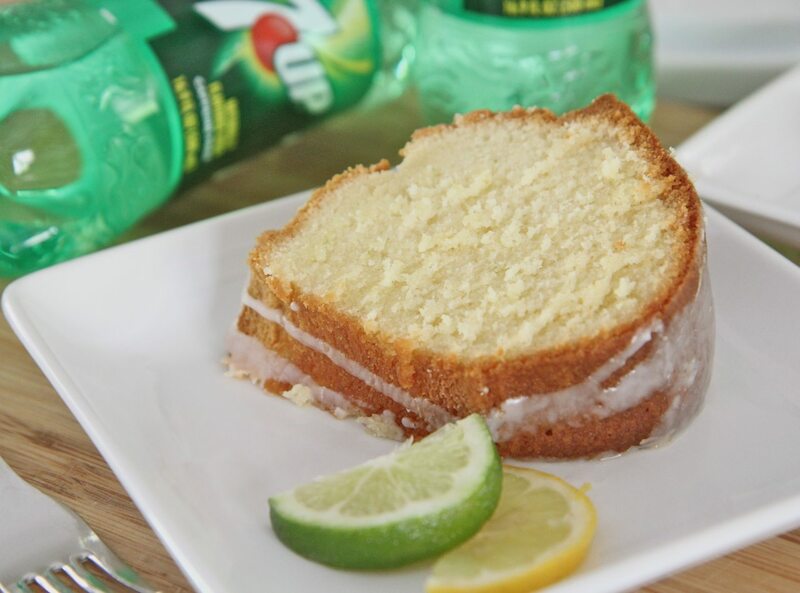 Try this classic 7-Up pound cake recipe!!! 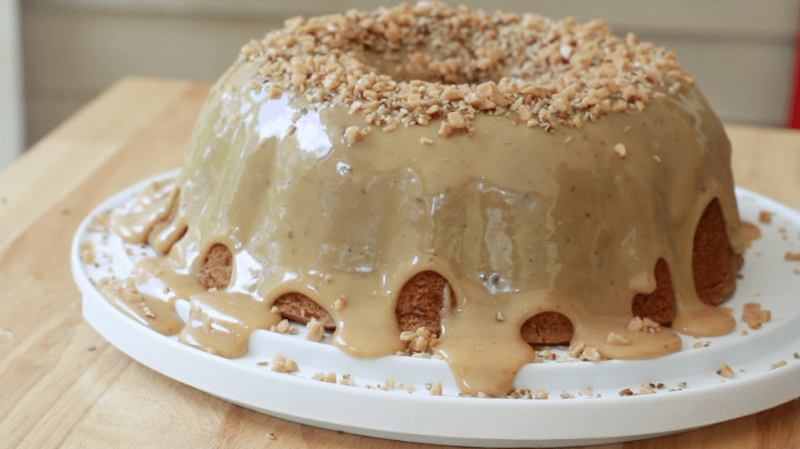 Watch me make this brown sugar caramel pound cake from start to finish! Preheat oven to 325. F.
Generously grease and lightly flour bundt pan. Set aside. In a large bowl, cream together butter and shortening. Mix in brown sugar and white sugar. Fold in vanilla extract. Set aside. Gradually add dry mixture into the wet mixture while alternating with the buttermilk and heavy cream. Mix well until combined being sure to scrape down the sides of the bowl. Pour batter evenly into prepared bundt pan. Shake the pan back and forth and up and down to even out batter and release air bubbles. Bake on the middle rack for 1 hour and 10 minutes. Remove from oven and let cake sit in pan for 10-15 minutes before removing and placing on a cooling rack to finish cooling. When cake is completely cooled start making the caramel frosting. In a large saucepan over medium-low heat, stir together sweetened condensed milk and brown sugar. Keep stirring until bubbles begin to gently break on the surface. Reduce heat if needed, do not let the mixture boil or simmer too rapidly to prevent burning. Continue cooking for about 5 minutes until mixture thickens, stirring constantly. Stir vigorously until butter is combined. Sauce will begin to thicken up even more as it cools. Let cake sit until frosting begins to harden. 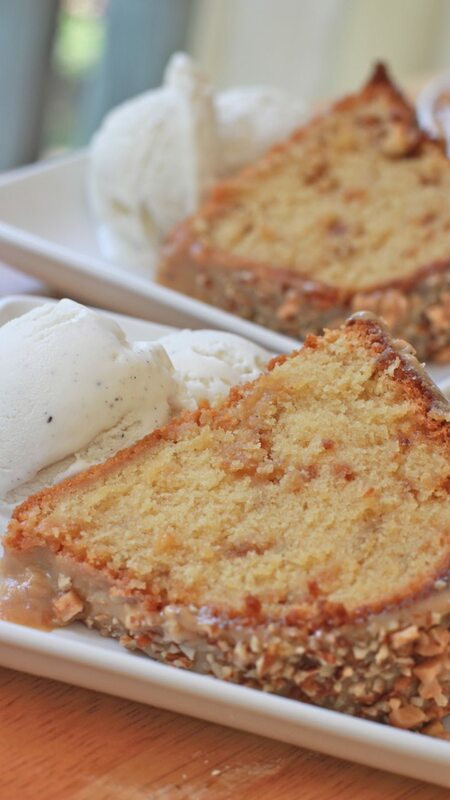 Slice and serve, add vanilla ice cream to take it over the top! BEST recipe ever! Delicious! Thank you Mrs. Diva! I made this for my husband who is from Alabama. He LOVED it. He declared it his favorite pound cake and that it needs to be my signature. Love your website!! I just love your videos. You are so lively and entertaining and your recipes are easy to follow. I can’t wait to try this one. It looks so good! This was bomblightful! My favorite ice creams are Blue Bell’s Butter Pecan and Moollineum Crunch. This cake put me in the best of both worlds. The beautiful Carmel rich butter and brown sugar flavor was like a warm blanket with the topping. I did not have toffee so I candied the walnuts with brown sugar and butter. I am still learning pound cakes so I overlooked it. However, this recipe will go into my famous recipe book. This is sure to be a show stopper/crowd pleaser. Thank you so much!!! Sorry, over cooked it.???????? It was still fabulous just thicker. The butter, shortening, buttermilk, and whipping cream shout have given a melt in your mouth texture. It was moist yet dry. Don’t over cook it friends.